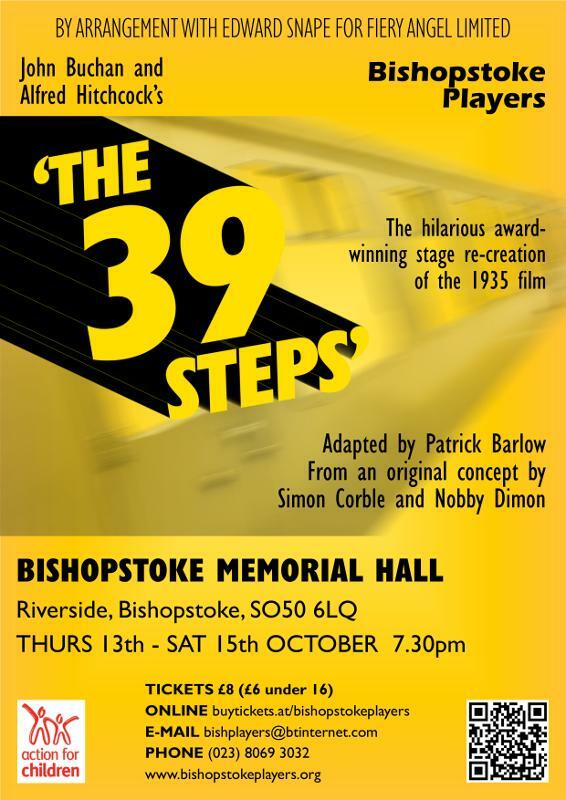 Bishopstoke Players are delighted to present Alfred Hitchcock’s classic 1935 thriller, “The 39 Steps”, which has been brilliantly and hilariously recreated for the stage by Patrick Barlow, Simon Corble and Nobby Dimon. Follow the spiffing adventures of our handsome hero Richard Hannay, complete with stiff upper lip, British gung-ho and pencil moustache, as he encounters dastardly murders, double-crossing secret agents, and, of course, devastatingly beautiful women. Nothing has been cut in this hilarious version of Britain’s most spell-binding thriller, based on John Buchan’s gripping whodunit of the same name. Legendary scenes include the chase on the Flying Scotsman, the escape on the Forth Bridge, the first theatrical bi-plane crash ever staged and the death-defying (or nearly!) finale at the London Palladium! This wonderfully inventive and gripping comedy thriller recently ended its long run at the Criterion Theatre in London’s West End, where it won the Olivier Award for Best New Comedy in 2007. 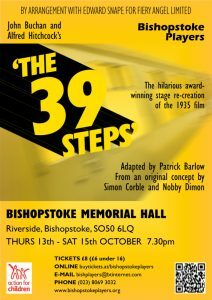 October 13 – 15 at Bishopstoke Memorial Hall, Riverside, SO50 6LQ. Please see poster for further details. … by Peter Yates, which won “Best New Play” and “Best Supporting Player” for James Gould at Elmbridge Drama Festival, and “Best Supporting Adult Player” for James at Totton Drama Festival earlier in the week! Well done to Pete Yates, James, and all the cast of ‘A Love Like Yours’. James will next appear as Benedick in ‘Much Ado About Nothing’ from 19th to 21st May.